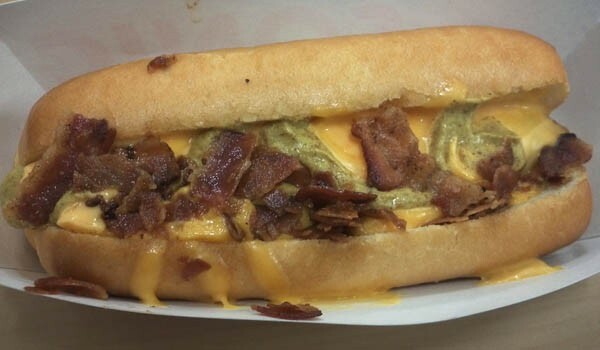 After mentioning the new Croissant Dog from Sonic yesterday, we saw a huge response from you, our readers, so today I headed over to Sonic and ordered the Bacon Double Cheddar Croissant Dog to tell you what I think. I paid $3.49, while the Original Croissant Dog would have only cost $2.99. 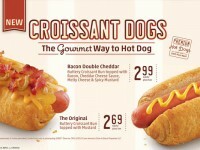 At first glance, the Croissant Dog does seem kind of small for a hot dog costing $3.49. I expected something larger than your standard hot dog. 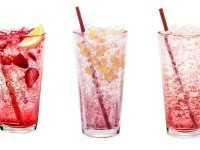 I am not extremely familiar with Sonic’s food other than their drinks and shakes, so that was a little disappointing. Looking at the actual Croissant, it doesn’t look for feel like a typical Croissant. The Croissant used isn’t flakey, and really compacted. It has the texture of a breadstick. When I peeled away the skin of the croissant, it definitely has the airy look and taste of a croissant. I figured they had to make it this way in order to give the hot dog a base. They couldn’t have the bun falling apart. The croissant was delicious, however I didn’t feel like it was incredibly unique, as it tasted more like a regular hot dog bun than a croissant, but all in all, it was still very yummy. What I absolutely loved was the combination of the melted cheese, cheese sauce, and the bacon pieces. The cheese sauce was warm and gooey, and mixed in really well with the melted cheddar cheese. The bacon pieces were very crispy, and there was a good amount of them completely covering the top of the hotdog. The beef dog was good too; however there really wasn’t much to it. Most of the flavor was in the cheese and bacon, but most of all, the added spicy mustard really rounded out the entire presentation. The mustard wasn’t too spicy, but added a great kick that counteracted the saltiness of the cheese and bacon. 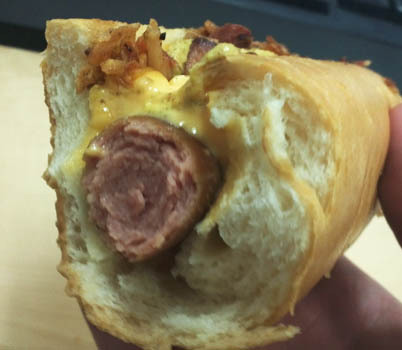 Overall, I found the flavor of the Sonic Bacon Double Cheddar Croissant Dog to be amazing. Everything worked together, and it had the perfect level of moisture and bread and toppings. 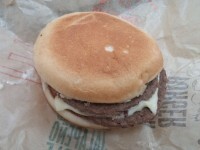 Also, it was very hearty, and even though it was somewhat small, it did a good job of filling me up. The only part where it lost points for me was the price. I would have been much more comfortable paying a dollar less and would have ordered it all the time.